Ana is a gorgeous solid black hanoverian mare with a wonderful temperament with an especially nice walk and canter. 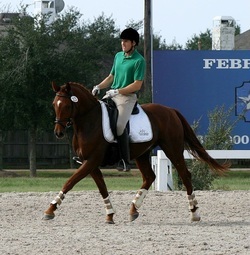 She is suitable for an amateur or professional with FEI ambitions. She showed Training level as a five year old and was exceptionally well behaved at shows. Ready to show 1st level and not far off from 2nd! "Prince" is a beautiful, well put together gelding boasting bloodlines on his sire's side from Florestan, Donnerhall and Rubinstein. He is suitable for an amateur or professional rider and is ready to show 2nd level. Schooling 3rd level. Price will increase when changes are confirmed. A definite FEI prospect! 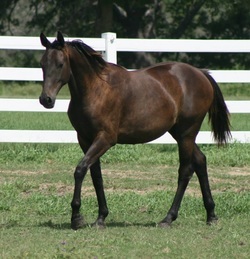 Sangria was a Premium Filly and Site Champion of her ISR/OLD NA as a foal. She was started March 2017 and is green but going well under saddle. Forward, sensitive but sensible. 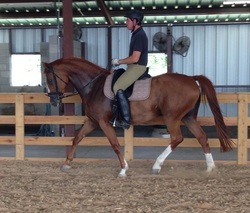 Sonnheim has big, fancy Warmblood gaits in a small package. He would be a lovely horse for a small lady or child. Good rideability - no buck, bolt, rear, etc... Green but coming along really well! This handsome boy stands about 16 hands and has three wonderful gaits. Currently showing training level and first level and schooling 2nd level. Started shoulder in, haunches in, turn on the haunches, canter-walk-canter. Sweet, friendly horse and very smart. Would make a great horse for a talented junior or amateur rider but potential enough for a professional. Congrats to Robin Malone on her purchase of this fine boy! Beautiful, premium producing broodmare. Her first foal, a 2007 colt by Balou du Rouet was premium colt at his GOV inspection. Her 2008 colt, Freedance, by Freestyle was Premium Foal and Site Champion. Freedance scored up to 77% at training level dressage as a four year old and was champion USDF All Breeds for ISR/OLD NA for training level and materiale in 2012. Dalliance's 2012 filly, Gran Diva, by Gran Casso was premium filly and site champion. Congrats to Lindsay Cooper on the purchase of this beautiful mare!